Earlier this month the USPS released a new set of stamps honoring four scientists: "some of the greatest scientists of our time, their pioneering discoveries still influence our lives today," according to John F. Walsh of the U.S. Postal Service's Board of Governors. Well, maybe! 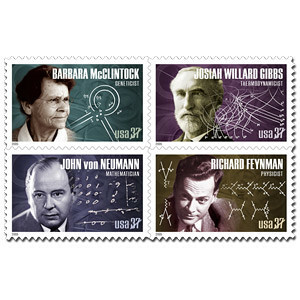 The four scientists are Barbara McClintock (geneticist), Richard Feynman (physicist), Josiah Willard Gibbs (thermodynamicist) and John von Neumann (mathematician/computer scientist). McClintock, Feynman and von Neumann are all more or less our contemporaries (their careers covered much of the last century)-- but Gibbs has been dead more than 100 years and I certainly would not count him "of our time". Gibbs' name is familiair to almost any chemistry student - through the Gibbs free energy. J. Willard Gibbs (1839-1903) was the son of a Yale professor of sacred scripture, and himself worked at Yale. Gibbs was not paid a salary for the first 9 years of his job at Yale. It was only once he had a job offer from Johns Hopkins University in Maryland that Yale began to pay him. He gained little recognition for his work during his lifetime mainly because of his inability to communicate his ideas so that others could understand the concepts he was discussing. With thanks to Tony Addison of Drexel for pointing me to the stamps. Gibbs also published his papers in a rather obscure journal, Transctions/Proceedings? 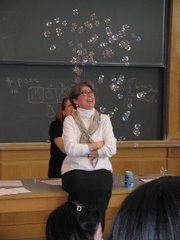 of the Connecticut Academy of Sciences.